More anguish for Rovers as they suffered defeat at the hands of Gillingham at the Mem on Tuesday evening. Elliot List and Callum Reilly were the Gillingham men who took their chances from similar pitch positions to score the crucial two goals of the game. No matter the fact that Gillingham create precious little else, and that Rovers comfortably had more chances. Even after Reilly’s indiscretion, seeing red for a late lunge, Rovers upped the gas, but often found chicanes rather than clear, open road. Then, Liam Sercombe’s 87th-minute free-kick sparked hope, and in an extended period of added time, chances flowed, but Gillingham, held out. Darrell Clarke had again decided that shuffling the pack was necessary, making five changes from the side that lost 3-1 at Charlton on Saturday. Ollie Clarke missed out through injury, while Stefan Payne, Ed Upson, James Clarke and Daniel Leadbitter dropped to the bench. Stuart Sinclair returned to the side following suspension, with Alex Rodman, Kyle Bennett, Joe Partington and Chris Lines also given the nod. 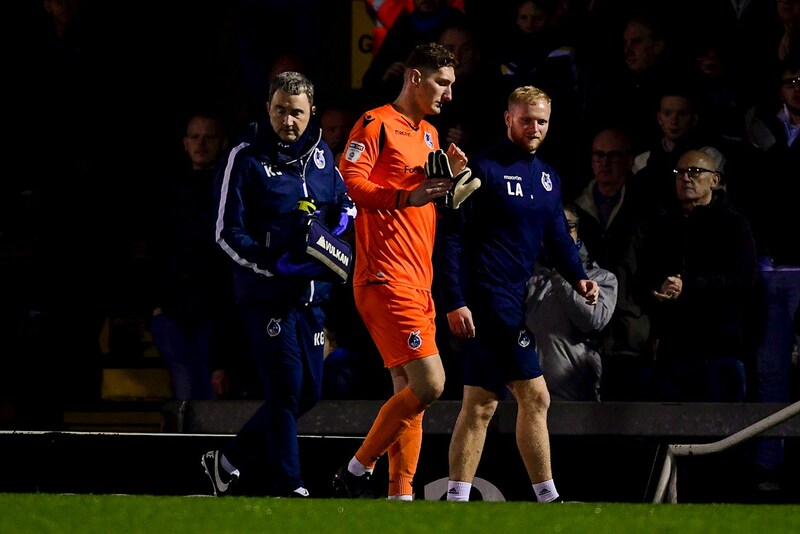 Before the eight-minute mark, though, Gillingham had a match-defining moment. 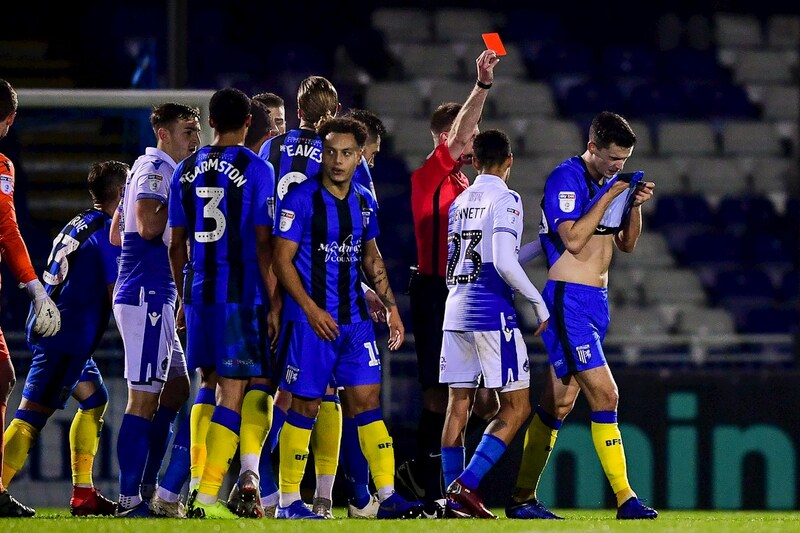 Rovers eyes certainly took more than a fleeting glance at the assistant referee as it looked as though at one Gillingham player had strayed offside, but after that had not been given, the home defenders did not do enough to eject the ball from danger. Capitalising was Elliott List, taking a shot from 20 yards that been a despairing Jack Bonham less through the pace of the hit, and more the earliness of the strike. Not only was that a lead for Gillingham, but something they could protect, for 82 minutes if they had their way. The away side set up camp to protect their advantage, meaning Rovers would have to be patient in trying to break them down. Patience. Not only a virtue, but a precious commodity. As groans became increasingly audible when Rovers played sideways or backwards, so the nerves became more visible. Gillingham lost captain and centre-back Gabriel Zakuani early on, but kept their shape admirably. Perhaps the Gas’s best attack saw the unlikely figure of Joe Partington running perpendicularly, then feeding Liam Sercombe, whose ball fell agonisingly between Rodman and Tom Nichols. Rodman curled wide twice from just inside the area, and Bennett saw one charged down, but Rovers could not build on several promising openings to an attack. At the other end Josh Parker had a dangerous header blocked by Tony Craig, to remind us that although protecting a single goal lead, they would seek a killer second if possible. Darrell Clarke went to his bench at half-time to bring on Stefan Payne for Rodman, switching to 4-4-2 and bringing Sercombe out to the wing, but within moments a second replacement was needed. Bonham succumbed to what appeared to be a back injury, and Adam Smith, who has played in Rovers’ recent cup games, came on. Payne got a shot on target after Parker had shot lost trying to hold the ball up for Gills, then a back-to-front move faltered when Nichols’ touch on Sercombe’s through ball let him down. Chris Lines then sold the whole ground a dummy as he burst into the box, only to see the ball nicked from his toes. The signs, though, were positive – so, naturally, Gillingham scored. A long ball towards Eaves fell to Callum Reilly, and as Rovers backed away, Reilly struck the bouncing ball from the edge of the area, and into the bottom corner. The first player to test Tomas Holy in the Gillingham goal was Bradley Garmston. If that name sounds unfamiliar, it is because Garmston was Gills’ replacement centre-back. He was on the end of a wickedly struck volleyed cross by Sercombe, inadvertently turning the ball goalwards. It looked like Rovers’ lifeline had come the most unexpected source, but Holy saved brilliantly, and Gillingham breathed out heavily. Rovers brought on Sam Matthews for Sinclair, moving Sercombe inside. This came seconds after Sercombe burst into the box and looked poised to shoot, but cut back on his right foot rather than swing the left. Bennett did eventually shoot, but it was blocked. List then blotted his copybook by lunging wildly into Sercombe and drawing a red card. Having increased the lead, he had now decreased the visitors’ numbers. Rovers had just under 20 minutes to capitalise. Bennett was first to try, but rather scuffed the ball following great work by Lines and Partington, then Nichols headed weakly at Holy when nearly bonusing from a Gills flick-on. Frantic stuff, now. Sercombe lashed from distance that Holy somehow tipped over, possibly with assistance from the crossbar. From the corner, Gillingham broke, and looked odds-on to kill the game off. Defender Connor Ogilvie found himself the further forward player, and tangled with the recovering Bennett. Had the referee given the free-kick, and he could have, Bennett would have walked. Nothing given. On 87 minutes, a lifeline. Sercombe was brought down not far outside the box, and dusted himself to curl in a gorgeous free-kick. If it was frantic before, it was now pandemonium. Payne backed into the key like LeBron, but could not tee up a free throw at goal. It got a corner, though, which Payne himself brilliantly flicked goalward, only to find Holy’s spirit too much again. Craig came haring forward to join in, during eight minutes of stoppage time, and got his head on a cross, and the ball fell to Sercombe, who sweetly caught a half-volley…that hit the post. Sercombe caught another one flush in the final seconds, but a match-saving block by Max Ehmer was enough to stop that, and prevent what would have been an amazing comeback. Rovers XI: Jack Bonham (Adam Smith 49); Joe Partington, Tom Lockyer (capt), Tony Craig, Joe Martin; Stuart Sinclair (Sam Matthews 69), Chris Lines; Kyle Bennett, Liam Sercombe; Alex Rodman (Stefan Payne half-time); Tom Nichols. Unused Subs: Daniel Leadbitter, Ed Upson, James Clarke, Gavin Reilly. Gillingham XI: Tomas Holy; Barry Fuller, Max Ehmer, Gabriel Zakuani (capt, Bradley Garmston 15), Connor Ogilvie; Darren Oldaker (Billy Bingham 83), Mark Byrne, Callum Reilly, Elliott List (Luke O’Neill 82); Tom Eaves, Josh Parker. Unused Subs: Tom Hadler (GK), Brandon Hanlan, Noel Mbo, Josh Rees. Booked: Parker 74, Holy 90.